Pleiotropy: Not dead yet: When do we give up on an idea? Guest post by Carina Baskett written in response to Angela Moles and Jeff Ollerton's post on Dynamic Ecology: Is the notion that species interactions are stronger and more specialized in the tropics a zombie idea? 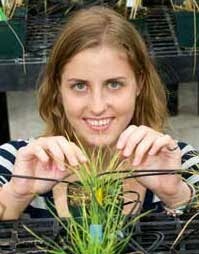 Carina Baskett is a PhD candidate at Michigan State University in the Department of Plant Biology and the Ecology, Evolutionary Biology, and Behavior Program. She posts photos from her fieldwork and occasional articles about tropical natural history, among other things, at Wandering Nature. If you’ve traveled to the tropics, you know the drill. Get your shots for typhoid and yellow fever, and your meds for malaria (try to avoid the one with psychotic side effects). Don’t drink the water, and avoid the lettuce. This over-abundance of diseases and parasites in the tropics is not just because sanitation is lacking in developing countries. Both diversity and severity of human parasites are higher in the tropics (Cashdan 2001; Guernier, Hochberg et al. 2004). Could the same be true for plant enemies? What about other biotic interactions, like predator-prey relationships, and plants and pollinators? And why? The first person to suggest that biotic interactions are somehow different in the tropical and temperate regions was Alfred Russell Wallace. Not only did he independently conceive of natural selection around the same time as Darwin (during a malarial fever in Malaysia, speaking of tropical diseases! ), he was also a great tropical naturalist. The relative contribution of biotic interactions to variation in relative fitness of organisms is greater at lower latitudes. Biotic selective agents drive faster divergence of allopatric populations than abiotic selective agents due to coevolution. Therefore, isolated populations speciate faster when the main selective agents are biotic. For parts B and C, I’ll just tease you with some references that explore or show evidence for these hypotheses in very different ways: Farrell, Dussourd et al. 1991; Schemske 2009; Paterson, Vogwill et al. 2010; Jablonski, Belanger et al. 2013. I’ll focus the rest of this on part A, which was recently labeled a “zombie:” false, dead, disproven. I’ll try and convince you that it’s nowhere near dead yet. I’m NOT trying to convince you that the hypothesis is true, because I think the answer is very much up in the air, but rather that it’s plausible and that we need more data. Here’s what this abstract figure would look like on the ground. This past winter here in Michigan was, to put it lightly, a doozy. Two years ago, it was so mild that I was told that my first Michigan winter didn’t even count. It’s not hard to imagine that even after lineages have evolved to tolerate freezing (which is a big deal—it kills cells! ), there can still be a lot of variation in fitness depending on the weather. Think of a plant that lives for a few years, flowering in the summer, producing fruit in the fall, and dying back over winter. Let’s assume that there’s a resource tradeoff between manufacturing antifreeze and producing fruits. ** This past winter, plants that invested a lot in antifreeze would have had high relative fitness in the population, because they alone survived. Two years ago, that same strategy would have had low relative fitness, because plants that produced less antifreeze would have survived the winter too, but had higher fruit production. In this hypothetical situation, there is some variation in fitness due to herbivores and pollinators etc., but most of it is due to the wildly variable weather. In contrast, imagine a similar plant in a tropical habitat, growing in full sun. It experiences temperature stress too. The sunshine is actually more intense in the tropics because it’s hitting the Earth straight on instead of at an angle, so its energy is concentrated in a smaller area. It’s HOT! But it’s hot almost every single day of the year, so all the plants in the population invest in tolerating the heat to the same degree. Temperature isn’t contributing much variation in fitness in this population. Now that I’ve painted a picture of what Figure 1 could hypothetically look like in the real world, how can we figure out whether or not it’s true? Needless to say, filling in Figure 1 with real data has not yet been done, and given our funding climate, it probably never will. But, there are other ways to approximately test the hypothesis (Schemske, Mittelbach et al. 2009). What we CAN ask is, what is the “intensity” of the interaction today? What do today’s traits tell us about selection in the past? And what is the frequency of an interaction in the community? To illustrate each question in terms of pollination, we can ask how much do tropical plants rely on self-pollination vs. outcrossing; do tropical plants invest more in pollinator attraction and reward; and, do tropical plant communities show a higher frequency of animal vs. wind pollination? Fill in the blanks with your favorite interaction. To build a relatively complete approximation of Figure 1, we should be asking these questions in many systems, across many types of interactions, and at many spatial and phylogenetic scales. For example, asking these questions within widely-ranging species (Salazar and Marquis 2012) is quite different from asking them at the community level, with disparate habitats, community membership, and growth forms (Moles, Wallis et al. 2011). Both approaches are needed, because each has huge advantages and severe limitations. The most comprehensive review of the available data is a 2009 Annual Reviews paper by Schemske et al. (see their Table 1). They noted that the data was insufficient for meta-analysis. Nevertheless, they found that most interactions show greater “importance” at lower latitudes; that is, the interaction is more intense currently, the traits show that it was more intense in the past, or it is more frequent. None of the interactions shows greater importance at higher latitudes. For example, in the tropics, predation rates on birds’ nests are higher. Ant predation rates on insect bait are higher. Parasite pressure is higher. Palatability of marine worms, salt marsh plants, leaves, and butterfly larvae is lower. The frequency of animal pollination, animal seed dispersal, ant-plant mutualisms, endophytes, and cleaning symbioses is higher. The review also finds that herbivory rates are higher and plants are better defended at lower latitudes, but a recent meta-analysis on herbivory came to different conclusions (Moles, Bonser et al. 2011). Although the results are necessarily qualitative and we can’t put a p-value on this statement yet, this review shows that looking across many types of interactions, many ways of quantifying their importance, and over many spatial and phylogenetic scales, the weight of the available evidence supports Figure 1. But I would be the last person in the world to tell you that we’re done testing part A of the biotic interactions hypothesis. Much of the available data was not generated to explicitly address it, so there’s always something missing. For example, herbivory rates could be the same at different latitudes, but tropical plants may be better defended, indicating that greater herbivore pressure has selected for stronger defense. You need both pieces of the puzzle, preferably measured at the same time on close relatives, to be able to say whether herbivore pressure is greater in the tropics. Therefore, I was dismayed when I woke up on Tuesday to a post on a widely-read ecology blog that claimed that the hypothesis that biotic interactions are stronger in the tropics is a “zombie idea.” Meaning that it’s dead, it’s been disproven, we can all go home now, and anyone who studies it is just wasting their time. Whoa. Not enough data for a meta-analysis, but we’re done with this question? A recent review concluded that there is support for the hypothesis, but now it’s been totally debunked? Did I miss something here? In fact, I haven’t missed anything. As with any scientific controversy worth its salt, there are contradictory reviews, there are people who are highly skeptical, there is massive confusion about what the hypothesis is and how to properly test it. That’s all fine and good. It’s exciting, even. What is not fine and good, in my book, is to proclaim from the rooftops that we’re done with a question that we’ve barely begun to address. To claim that a handful of publications on latitudinal gradients in herbivory are the end-all, be-all, period end of story of decades of research. To claim that any one of us has the final authority on how to define, test, and interpret an area of science. A debate about an idea can be constructive and fun. But both my scientific and journalistic selves cry fowl when a story is presented hyperbolically from one point of view. I believe that it’s irresponsible and polarizing to instigate a debate by claiming that the problem is solved and there is no debate. I’m glad that people are talking about the topic, though I wish it had been inspired by less inflammatory language. I hope the conversation inspires us to clarify what our questions are and how we can test them. I hope also that you agree that we don’t need more catchy metaphors (zombies, old clothes, lemmings, sheep). We need more data and more conversation. Period. But not the end of the story. *There are so many species in the tropics! There are over 22,000 tree species in the Amazon, compared to 620 in temperate North America (Currie and Paquin 1987; Fine and Ree 2006). This pattern of higher species diversity in the tropics is remarkably consistent across different types of organisms and through time and space. How can the same underlying processes of ecology and evolution produce such different outcomes? We don’t really know! Sure, there are ideas. In fact, Palmer (1994) lists 120 hypotheses to explain it! But given the massive scale of space and time, it’s really hard to test these hypotheses, so a definitive answer remains elusive. See Mittelbach, Schemske et al. (2007) for a great review. **For any of this to matter for evolution, we are also assuming that allocation strategies are not very plastic; that they are heritable; and that there is genetic variation for these strategies in the population. ***Why am I focusing so much on temperature? Lots of studies show that climatic variables, especially temperature, are tightly correlated with global diversity patterns (e.g., Currie, Mittelbach et al. 2004). In my opinion, for a few reasons, the biotic interactions hypothesis is the only latitudinal diversity gradient hypothesis that provides a plausible mechanism by which temperature can affect diversity. But actually, the hypothesis is generalizable to any gradient in abiotic stress. Although it was proposed to address the LDG, it applies to other gradients in abiotic stressors that covary with species diversity: altitude, ocean depth, precipitation, etc (Schemske, Mittelbach et al. 2009). This is a practical strength because components of the biotic interactions hypothesis can be tested in other systems, which may be more tractable than latitude. More importantly, it is a theoretical strength because confirming this hypothesis could revolutionize our approach to studying the origins of diversity in many systems. Cashdan, E. (2001). "Ethnic diversity and its environmental determinants: Effects of climate, pathogens, and habitat diversity." American Anthropologist 103(4): 968-991. Currie, D. J., G. G. Mittelbach, et al. (2004). "Predictions and tests of climate-based hypotheses of broad-scale variation in taxonomic richness." Ecology Letters 7(12): 1121-1134. Currie, D. J. and V. Paquin (1987). "Large-scale biogeographical patterns of species richness of trees." Nature 329(6137): 326-327. Dobzhansky, T. (1950). "Evolution in the tropics." American Scientist 38: 209-221. Farrell, B. D., D. E. Dussourd, et al. (1991). "Escalation of plant defense: Do latex and resin canals spur plant diversification?" American Naturalist 138(4): 881-900. Fearnside, P. M. (2005). "Deforestation in Brazilian Amazonia: History, rates, and consequences." Conservation Biology 19(3): 680-688. Fine, P. V. A. and R. H. Ree (2006). "Evidence for a time-integrated species-area effect on the latitudinal gradient in tree diversity." American Naturalist 168(6): 796-804. Fischer, A. G. (1960). "Latitudinal variation in organic diversity." Evolution 14: 64-81. Guernier, V., M. E. Hochberg, et al. (2004). "Ecology drives the worldwide distribution of human diseases." Plos Biology 2(6): 740-746. Jablonski, D., C. L. Belanger, et al. (2013). "Out of the tropics, but how? Fossils, bridge species, and thermal ranges in the dynamics of the marine latitudinal diversity gradient." Proceedings of the National Academy of Sciences of the United States of America 110(26): 10487-10494. Mittelbach, G. G., D. W. Schemske, et al. (2007). "Evolution and the latitudinal diversity gradient: speciation, extinction and biogeography." Ecology Letters 10(4): 315-331. Moles, A. T., S. P. Bonser, et al. (2011). "Assessing the evidence for latitudinal gradients in plant defence and herbivory." Functional Ecology 25(2): 380-388. Moles, A. T., I. R. Wallis, et al. (2011). "Putting plant resistance traits on the map: a test of the idea that plants are better defended at lower latitudes." New Phytologist 191(3): 777-788. Palmer, M. W. (1994). "Variation in species richness: towards a unification of hypotheses." Folia Geobotanica & Phytotaxonomica 29(4): 511-530. Paterson, S., T. Vogwill, et al. (2010). "Antagonistic coevolution accelerates molecular evolution." Nature 464(7286): 275-U154. Salazar, D. and R. J. Marquis (2012). "Herbivore pressure increases toward the equator." Proceedings of the National Academy of Sciences of the United States of America 109(31): 12616-12620. Schemske, D. W. (2009). Biotic interactions and speciation in the tropics. Speciation and Patterns of Diversity. R. K. Butlin, J. R. Bridle and D. Schluter. Cambridge, United Kingdom, Cambridge University Press: 219-239. Schemske, D. W. and C. C. Horvitz (1988). "Plant-animal interactions and fruit production in a neotropical herb: a path analysis." Ecology 69(4): 1128-1137. Schemske, D., Mittelbach, G., Cornell, H., Sobel, J., & Roy, K. (2009). Is There a Latitudinal Gradient in the Importance of Biotic Interactions? Annual Review of Ecology, Evolution, and Systematics, 40 (1): 245-269 DOI: 10.1146/annurev.ecolsys.39.110707.173430. Great post. Well done for pushing back. Like you I am pleased to see the discussion but find the "zombie" label somewhat irritating when I disagree with the diagnosis! We need more nuance. how do you feel about the zombie label when you *agree* with the diagnosis? Honest question. Because if you like it, or at least don't mind it, then that suggests that your irritation isn't actually with the label per se, or even with the label at all. Re: nuance, I'm all for it! But my experience is that when a non-nuanced idea is established in many people's minds, the only way to get to nuance is to first get people's attention with non-nuanced pushback. Here, the ideas Jeff and Angela critiqued really are the mainstream view (meaning not that everyone holds it, of course--but lots of people do). And the mainstream view is sufficiently well established and *non*-nuanced that it's often difficult for people to publish empirical papers disagreeing, because referees just assume that those papers "must" somehow be flawed. So it's not as if Jeff and Angela's post is trying to wipe out nuance that currently exists. It's trying to get people's attention and get them thinking in a critical and nuanced way about claims that they are *not* currently thinking about in a critical and nuanced way. I think the comment threads on Dynamic Ecology nicely illustrate my point of view here. There is *no way* that the wonderful ongoing discussion of Jeff and Angela's post would've happened if they'd written a dry, nuanced piece full of hedges and ifs and buts and qualifications. Same for, say, Brian McGill's post on whether estimating detection probabilities is statistical machismo. That post drew our longest comment thread ever, with high-level contributions from everyone from sharp grad students to top wildlife ecologists. But that discussion doesn't happen unless Brian kicks it off with a post that pushes back hard against the conventional wisdom, using both good arguments *and* attention-grabbing rhetoric. I could give many more examples. Conversely, I could name plenty of posts where I wrote them in a drier way--and got few readers and no comments. Don't misunderstand, I fully recognize that rhetoric like "zombie ideas" is *always* going to turn off some readers. And I feel bad about that--as an author who's writing to convince, you never want to turn off any reader. But for better or worse, there are many readers who feel differently--who like rhetoric and (well-argued) opinions to the point of being actively turned off by bland technical writing. So as an author, you just have to choose which readers you want to attract and which you want to turn off. Do you think if I cut out everything starting from "I've spent the last three years...", and this were posted at Dynamic Ecology, it would be too boring and dry to receive a good discussion? Because I'm being too respectful and nuanced, and my language isn't over the top enough? Even if it were true, in my mind it doesn't redeem the strategy. But to each his own. I would encourage you to try a new poll. Ask graduate students how many of them would feel intimidated and fear actual harm to their careers if a popular blog in their field called their chosen area of study "dead." Maybe after the poll you wouldn't feel so surprised when a student reacts strongly to your rhetoric. "Do you think if I cut out everything starting from "I've spent the last three years...", and this were posted at Dynamic Ecology, it would be too boring and dry to receive a good discussion?" Hard to predict the traffic a particular post will receive. And of course there's always more than one way to write any given post. Your post is quite good, and if the cut-down version you suggest had been published on Dynamic Ecology, I'm sure it would've been well-received and drawn at least a few comments. But sorry, I doubt it would've become one of our most-commented-upon posts ever, as Jeff and Angela's post has become. More broadly, there are lots of ecology blog posts about all sorts of research topics, written more or less like yours. That's what a fair bit of the ecology blogosphere consists of--people writing the sort of post you suggest about their own research area. Do most of those posts draw lots of comments, or even any? Don't get me wrong, there's nothing wrong with those sorts of posts! I certainly don't think everybody should blog the same way, or actively seek out excuses to criticize the work of others, or just slap the label "zombie idea" on any and all ideas they don't like. I just think there is a legitimate space online for people to push back strongly against scientific ideas with which they disagree, and to use rhetoric to help get the attention of readers. Even though such writing inevitably will bother some minority of readers. But if you think that sort of thing should always and everywhere be out of bounds (even outside the confines of scientific journals), well, as you say, to each his own. Re: polling graduate students: if I polled graduate students and asked them if they'd be intimidated if an established ecologist asked them a challenging question after their talk at the ESA meeting, I bet a lot of them would say yes. If I polled graduate students and asked them if they were really nervous about how their candidacy exams and thesis defenses would go, I bet a lot of them would say yes. If I polled graduate students and asked them if they'd be upset if a leading journal were to publish a peer reviewed paper (like my TREE paper on the intermediate disturbance hypothesis) arguing against views that they themselves held, I bet a lot of them would say yes. Kudos to you for not letting any initial hesitation stop you from making a bunch of really thoughtful contributions to what's been a great discussion. Without you, the discussion would've had a narrower range of views and would've been much poorer. Sorry was offline all day yesterday so couldn't react. "how do you feel about the zombie label when you *agree* with the diagnosis?" Well I wrote the comment I did precisely because I see the "weighing" up of + and - as a somewhat subjective matter. I don't think we disagree on this from what I have seen. We just need to be careful and ensure that the nuances are not discarded for straw man rhetoric. Indeed debate is a great way to get attention for a subject, but at a certain point we need to be careful not to trivialize the points of disagreement if we want to agree the basis for the difference and how we might move forward. Carina is doing the right thing by getting back to the substance of the debate. Maybe some details help: I'm Irish but have worked a lot overseas working with researchers from different cultures. In Ireland it is normal for us to argue with everything just for the entertainment value of it. Indeed, it is normal to argue a point you don't agree with just out of the playfulness of it, and opponents wont (usually) get upset. Engaging the argument as an opponent shows interest and no dis-respect, the whole thing is play. Points can be serious or they can be humorous (or in between too) But in many other cultures that approach can, and sometimes does, get me into trouble ... so I often find myself explaining that I am arguing because I'm interested and want to understand the different viewpoints. So while I'm all for playful debate I have also found myself apologizing when I am over enthusiastic. People do get upset! My own take on the IDH zombie. I can still find it amusing, but to be a little more serious I'm disappointed that you and many of your readers remain happy to call the IDH a "zombie". We've had the topic get attention, we've had the discussion, we've agreed on the points that matter... except perhaps on "labels", yes these matter, but that discussion seems reasoned and reasonable ... I don’t see a zombie argument being useful. So perhaps that zombie idea has itself become a zombie -- it is no longer helpful. Lets kill it. I think the idea is not dead. But, I feel the idea is quite ambiguous (at least based on blog posts --- I never studied it), including the definitions of terms used. It would be difficult for ecologists to prove or disprove something this ambiguous. You are assuming the existence of trade-offs in terms of resources that can be used for dealing with abiotic and biotic factors. Based on the comments at DE, I think people do not agree even on this first assumption. I would like to see evidences for the global pattern of these trade-offs. It may be so obvious (to some people), but if so showing it should be easy. I agree with you on this part. A tradeoff between investing in traits to deal with abiotic vs. biotic factors has always been the hardest part of this for me to wrap my brain around. So if I'm a plant and I need to make antifreeze, maybe I can't make as many secondary compounds to protect my leaves...but I kind of doubt that it's that direct of a tradeoff, and similar to what you said, it could even be possible that there are compounds that serve both functions. And then thinking about including the herbivore in this thought experiment makes my head explode. BUT even the process of writing this out helped me think about it more than I had before, and I realized that we don't necessarily need to invoke a direct tradeoff between investing in traits for dealing with the abiotic vs. biotic environment. In my example here, it's just a simple survival-reproduction tradeoff that could be totally unrelated to biotic interactions. And I'm not totally sure we need to invoke tradeoffs at all...this is a plausible example of how even a species that has evolved freezing tolerance might still have a lot of variation in fitness due to winter. But maybe there are ways to imagine that variation without talking about tradeoffs. I'll think about that. In conclusion, you're right, this is a weak point and I'm still thinking about it. But I think the important point is where is the most variation in relative fitness in a population coming from? If it's from an abiotic selective agent, then even without invoking a direct tradeoff between dealing with abiotic and biotic factors, it follows that selection is *relatively* weak from biotic agents compared to a place where variation in fitness due to the abiotic environment is quite low. And if selection by, say, pathogens is generally weaker in one place than another, we should see a signature of that in defense traits. Do you mean variation among individuals of the same species or variation in the mean fitness among (some) species, or variation among individuals (without species distinction)? It is difficult for me to think what actual data will convince me (for or against). If I see more plants died (or reproduced less) due to virus infection in Michigan, which usually increase variation in fitness because not all individuals will be infected. In another population(s) in Ohio, virus infection did not occur, so the variation in fitness (I am still very much arm waving in terms of the quantification of fitness appropriate for this study, though) coming from the interaction with virus is small. Does this mean that Michigan populations have stronger biotic interactions (if this pattern is persistent)??? Fitness, after all, is a surrogate for testing the idea, but is it a good one? I almost get confused what the idea to begin with… Is it the trade-off? Is it the strength of biotic interactions? (Probably the strength of biotic interactions and some mechanism for it.) What is the strength of biotic interactions? I suppose you are defining it as how much fitness is influenced by biotic interactions. Then I wonder how one can convincingly use variation to make a strong argument (although I am sure you are looking many more things) --- especially if it is just variation naturally observed. Now I don’t know what I am talking about by myself. I think you are doing it with your close peers already, but you should come up with the best scenario data (as explicitly as possible) and check whether your argument really can convince skeptics at least based on the best case scenario (though you should not do such on blogs). I mean variation in relative fitness among individuals in a population. For selection to occur, we need variation in a trait, variation in fitness, and covariation between fitness and a trait. It a little more intuitive to understand Fig. 1 if you think of the arrows as the strength of selection coming from these different selective agents, even though that's not quite accurate because selection acts on traits and we don't have traits in the diagram. "what is the “intensity” of the interaction today? What do today’s traits tell us about selection in the past? And what is the frequency of an interaction in the community?" It's possible that the first two patterns could contradict each other; if so, we would need more information to tease apart what's going on. That's one reason, too, that you really want both of those pieces of information if you can't just look at presence/absence of an interaction. Hope that helps clarify things, sorry if I'm just muddling it. I didn't quite catch your meaning, what should I not do on blogs? Sorry, I should have said, "What data do we need to get to test this?" rather than "how do we get the data to show this." I don’t know much about path analysis or structure equation analysis to really know the potential of them. Is it possible for strong species (or biotic) interactions to cancel out to result in small variation in relative fitness variation? Can the same result be obtained from many different types of biotic interactions? Can path analysis really tease apart these details? This also goes back to what is the strength of biotic interaction in the original idea? Can everyone agree with your definition? One of the reasons why I think it is difficult to prove or disprove the original idea is because depending on what specific things we look at (and we can always look at only specific things), I feel it is possible to get all sorts of different conclusions. I think rater than looking at the endpoint (the pattern of the strengh of biotic interactions), directly looking at the mechanism (e.g., trade-off or else) is more satisfying (although I think you are doing both). Hi Carina, thanks for you well thought-out response. You’ve got me thinking again. I don’t like the zombie label here either. The only thing that makes me wary is when you write “how we can fill in the missing gaps”. This sounds a tiny bit too much like wanting to confirm a belief rather than being open for the outcome (although your careful thoughts suggest this is not how you do your science). 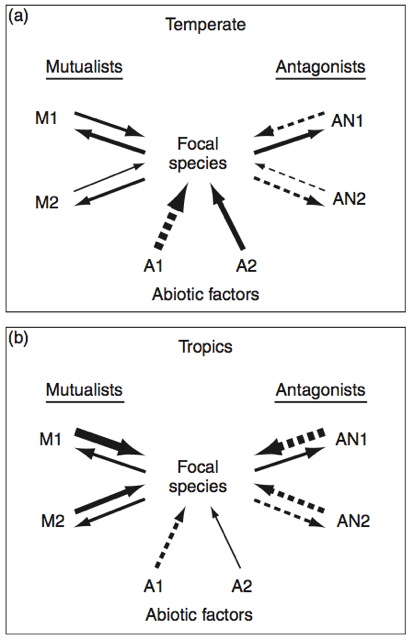 Admittedly, the biotic interactions explanation for tropical diversity is appealing. For your sub-hypothesis A, the most convincing evidence seems to me the high percentage of plants that are pollinated and dispersed by animals. But do B and C work for highly generalized interactions? Taking some delightful examples aside, most tropical frugivores and pollinators seem to be quite generalized. Plus for coevolution to promote divergence, I would imagine the mutualists should also be divided into allopatric populations (which may not always be true, given that many of these mutualists are quite mobile – that’s why the plant needs them in the first place). Am I wrong here, or are the more likely diversifying interactions those with less support for higher importance in the tropics? This is not intended to conclude the case, but to remind you that when splitting the theory into testable bits, the individual results should also fit together in the end to have the overall theory confirmed. Hi! Sorry, I don't mean fill in the gaps like confirm a belief. I just mean we need to try and get the data to test the hypothesis that Figure 1 shows. Unfortunately, like I said, testing it directly would be quite a project, so we have to nibble at the edges (is that more appropriate than “fill in the gaps”?). Biotic selective agents (whether composed of one or several species) can coevolve, while abiotic selective agents cannot. In an environment where the main selective agents are abiotic, populations will adapt to a relatively “fixed” adaptive peak. In an environment where the main selective agents are biotic, populations should be constantly chasing a “moving” adaptive peak, exemplifying Red Queen dynamics. As Janzen once said, “The winter experienced by a northern pine or oak has probably not changed in the past 60 million years, nor has the good solution to its challenge; the biotic challenge to a rain-forest Dipteryx panamensis most decidedly has changed” (p. 633 of Costa Rican Natural History, 1983). Not only will allopatric coevolving populations undergo greater evolutionary change from a common ancestor because of the moving adaptive peak, but the biotic adaptive peaks will also move uniquely in each population, invoking Thompson’s good ole “geographic mosaic of coevolution.” We don’t expect coevolution to follow the exact same course everywhere. Each of these two elements of coevolution (the adaptive peak is moving, and it’s moving differently in each population) should lead to greater divergence in allopatry when the main selective agents are biotic vs. abiotic. If adaptive divergence in allopatry is the main driver of reproductive isolation in nature, then this mechanism explains how biotic interactions can lead to greater speciation rates in the tropics. Fig. 3 of Dyer, L. A., M. S. Singer, et al. (2007) Nature 448(7154): 696-U699. Novotny, V., S. E. Miller, et al. (2007). Nature 448(7154): 692-U698. Thanks for the great discussion/questions/comments! Oh, and one more thing, I totally agree with you that the most convincing evidence is in regards to mutualisms. It's easy to see that many mutualisms are more prevalent at lower latitudes. But antagonisms are everywhere, so it's way harder to figure out where they're "stronger" or more intense. How do we even test that?? I think that's a big reason that herbivory is so controversial! It's not an easy question to answer, and it's a work in progress. It may turn out that somewhere down the road the hypothesis has been modified to be specific to mutualisms. I'm excited to see where the evidence goes. As I said elsewhere, Carina, I'm going to post a fuller comment on your response to our piece when I have time, but I couldn't let that last point pass without saying something. "The relative contribution of biotic interactions to variation in relative fitness of organisms is greater at lower latitudes". Relative fitness is a population-level trait, not a community trait. So how does the fact that a lower proportion of species are wind pollinated in tropical communities tell us anything about relative fitness? I honestly don’t follow your line of reasoning here. It's evidence supporting the hypothesis because more species in the tropics look like Fig. 1B and more in the temperate look like Fig. 1A...in fact, Fig. 1A sans a mutualism or two. Does that answer your question? Thanks, that's cleared it up in my mind. But it seems to me to be a big leap to go from a hypothesis that is framed in terms of relative fitness within a population to broad-scale patterns of occurrence of wind versus animal pollination, and to describe the latter as "the most convincing evidence" to support the original hypothesis. The relative frequency (% of plant species) of animal pollination is very variable across communities within latitudinal zones, and the tropics and the temperate zone overlap significantly, e.g. the range in the tropics is 78% to 100%; in the temperate zone it’s 33% to 96% of plants within a community that are animal pollinated. Even at sites close together there can be a difference, e.g. tropical rainforest and savannah communities in Guyana were 95% and 86%, respectively, despite being only a few kilometres apart. This says more about the type of habitat than it does about whether that community is in the tropics or at higher latitudes. These data support alternative hypotheses that explain the relative frequency of wind versus animal pollination in communities, and particularly the role of past climates (notably rainfall) and species richness (wind pollination requires a minimum density of individuals which is often not achieved in very species rich communities). A manuscript on this is currently in review, though I can send you a copy if you’re interested. But most of the relative frequency data can be seen in Ollerton et al. 2011 Oikos. True that relative frequency of wind pollination varies by community. But as your own data show, there is a pattern of increasing frequency of animal pollination with latitude. Whatever the causes of that pattern, the consequence is that more species in the tropics look like Fig. 1B and more species in the temperate look like Fig. 1A minus some mutualistic arrows. It's difficult to measure the widths of those arrows (or even to approximately understand the relative widths of those arrows), so to me it's pretty convincing when you can show that some arrows are typically present in the tropics and often absent in the temperate zone. The leap from fitness in a population to the broad-scale community patterns is shown by the "Temperate" and "Tropical" labels in the figure, which mean that typical species in the temperate zone experience 1A and typical species in the tropics experience 1B. I can certainly understand why you’d see this as support for the hypothesis but it’s hardly the “conclusive evidence” that you describe. It gets to the heart of one of the problems with this idea, in that it treats “the tropics” as a single, homogenous whole (ditto the temperate zone). At an ecosystem scale (the scale at which the processes you’re describing have an effect) these regions are very variable in terms of species richness and influence of abiotic factors. So there are both tropical and temperate areas with very high species richness that are highly influenced by abiotic factors such as drought and fire (e.g. in parts of Africa and South America). And tropical forest that has modest species richness but relatively benign climate. Some other points below, as I promised (there's a character limit for comments). Any hypothesis that seeks to explain the latitudinal trend in species richness as being largely the result of a single process (in this case due to the relative contribution of abiotic versus biotic effects on relative fitness) has got to be as all inclusive and encompassing as the pattern it seeks to explain. But the comparisons being made within this argument seem to focus on terrestrial forest versus lowland wet tropical communities. The “tropics” are more than that and in fact the hypothesis is falsified by examining marine communities: they show the same overall increase in species richness towards the equator, but temperate waters are if anything more benign than tropical, because colder water has higher oxygen levels and tropical reef waters are notoriously nutrient poor. Presumably tropical marine species must invest more resources to overcome these abiotic limitations? Finally, my particular interest, specialization of interactions. In your response you describe specialization as “tangential” to the discussion but I would argue that, in fact, it’s central to this argument because there will be stronger, more consistent selection on biological traits in specialized interactions rather than more generalized interactions. For example, we would expect a single pollinator to consistently select for particular floral traits, and the more additional pollinating species you add to the mix, the less consistent the selection. The same argument can be made in relation to coevolution between antagonists and defences, and specialization is at the base of a number of biotic interactions which generate diversity e.g. mimicry. So why ignore specialization as “tangential” and related only to discussions of coexistence? I note that Doug does something similar in is AEES review; he talks about how important specialization is to discussions about tropical diversity, but states that: “The few studies on this topic have found mixed results” and cites three papers. In fact even in 2008 there were at least 12 studies involving 15 data sets that could have been assessed. A simple ballot-count of the results from these studies shows that 5/12 demonstrated greater specialization in the tropics, 7/12 did not find such a trend. Likewise Vazquez & Stevens (2004) Am. Nat. [which Doug didn’t cite] analysed other data and likewise found no overall trend. These results are not “mixed” (implying uncertainty) they show that interactions are not always more specialized in the tropics. None of this is incorporated into Table 1 of Doug’s review, on which you’ve drawn heavily. This clearly states the role of specialized interactions within these communities was central to the original arguments about tropical diversity, and it’s unclear to me why this has subsequently been dropped from the discussions. It’s taken me a while to post this but please don’t see that as an indication that I’m not interested in your views or wish to close down the discussion: I’m currently submerged in grading student work and writing grant applications, so have limited time! Regardless of the rhetoric we used in the Dynamic Ecology post, these are interesting questions that deserve wider discussion and interrogation than they have to date, so thanks for posting your response. Hi Jeff, I've been traveling so pardon the delay. Here are my responses to the smaller points, and next I'll have a longer one for the main point. On that note, I know absolutely nothing about nutrient cycling in marine systems, but could this be a similar case to what I mention in the post about temperature stress in tropical plants? Certainly there is temperature stress in the tropical scenario, but within the population I don’t see it causing variation in fitness, compared to the temperature stress in the temperate scenario. “Regardless of the rhetoric we used in the Dynamic Ecology post, these are interesting questions that deserve wider discussion and interrogation than they have to date.” I could not agree more with this statement. Now if only all the people who read the original post or even just its title felt the same way…but somehow I doubt that’s the message they came away with. I think specialization is tangential because you don't need “tight” coevolution (in a specialized interaction) in order for two allopatric populations to diverge from each other faster for a trait evolving in response to a biotic vs. abiotic selective agent. Imagine if two populations of a tropical tree were separated from each other for 10 million years, and the main source of variation in fitness in each location is herbivory. Even if the plant chemistry starts out the same in each locale, it will quickly diverge as the trees in each place evolve non-identical ways to attempt to resist their herbivores. Next, three possible responses from the herbivore community could occur (and each plant population may experience different combinations of these over time). Any of these would change selection on defense, leading to further evolution of defense, and further divergence of the two populations. These responses are: (1) “tight” coevolution with a subset of herbivores that evolve to specialize on the plant, (2) “diffuse” coevolution with the herbivore community if none are particularly specialized/dominant, and (3) non-evolutionary responses by the herbivore community (shifts in species’ relative abundances on our plant). All of these can impact selective pressure on defense. Even if scenario (1) doesn’t happen, there is ample opportunity for evolution and divergence of plant defense between our two allopatric populations, because the herbivores are responding to the plants in some way, necessitating continual evolutionary counter-response from the plants. In contrast, climate does not respond to plants (at least not on the scale we’re talking about). So it seems reasonable to expect that our two tropical populations will diverge from each other much more in 10 million years compared to two populations of a temperate tree, whose main source of variation in fitness (we are assuming) is the unchanging, unresponsive winter. All of that can happen without necessarily invoking highly specialized interactions, though I think specialized rather than diffuse coevolution would speed up the process. I cannot speak for Doug, but speaking for myself, that is why specialization is not a major part of my conceptual framework of these ideas. That being said, there’s this whole other thing that happens after speciation—coexistence—that I think ALSO has something to do with biotic interactions being more important in the tropics, and I’m not the only one who thinks that! See the Janzen-Connell literature. There, specialization is a big part of the discussion. But how about let’s leave that debate to the Janzen-Connell experts? I’m not one of them. "The ideal metric for evaluating the importance of biotic interactions would be to estimate the proportion of the total variation in fitness that is due to biotic interactions in different geographic regions (Schemske 2009). Not surprisingly, such a comprehensive study has never been done. We thus enumerated the importance of biotic interactions in several ways, including (a) the “strength” of biotic interactions, e.g., bird nest predation, (b) the expression of traits involved in biotic interactions, e.g., chemical defense against predators, and (c) the frequency of different biotic interactions, e.g., seed dispersal by animals versus wind. " You’re right that “strength” is not precisely defined there. It makes sense to me in this context as a rate of an interaction: predation/herbivory rate (what proportion of something is eaten in a given amount of time), or pollination rate (how many flowers are visited in an hour, or better yet, outcrossing rate in an animal-pollinated species). Maybe there’s a better way to generally define it without having to resort to examples? E.g., “the frequency, and the magnitude of its positive or negative effect on growth/survival/reproduction/fitness, of an interaction between two species”?